No matter how many renditions of the Star-Spangled Banner you've seen as a sports fan, there's a good chance you've never witnessed an anthem like the one before an ECHL game this weekend. 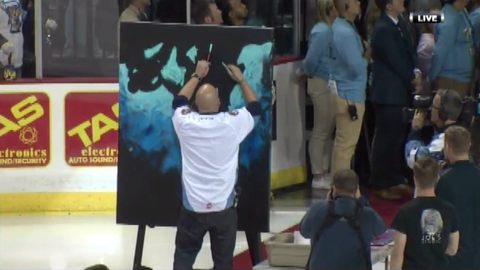 The Toledo Walleye invited artist Joe Everson to perform the national anthem before Saturday's home game against the Brampton Beast, and he brought a unique twist to the duty that not many could pull off. Everson is more a visual artist than of the recording variety, so his singing was accompanied by a live canvas painting performance that left fans captivated. While it wasn't quite clear what exactly Everson was painting at the start, his grand finale was well worth the wait. This is Bob Ross meets patriotism meets hockey. It is amazing. If you want to check out more of Everson's work (which, turns out, isn't typically accompanied by song), check out his personal website.